“Cessna 43L, cleared into Class Bravo airspace at 7’500, follow interstate I-25 to Centennial”, Denver Center told me while flying in simulated instrument conditions. The sky was blue but I had to wear foggles, glasses which restrict the view outside. While trying to fly IFR, with vectors from my instructor, I had to follow a road VFR. Among VFR pilots there is the saying that IFR meant “I Follow Roads”, which was exactly what I was doing on this cross country flight to the North of Denver. 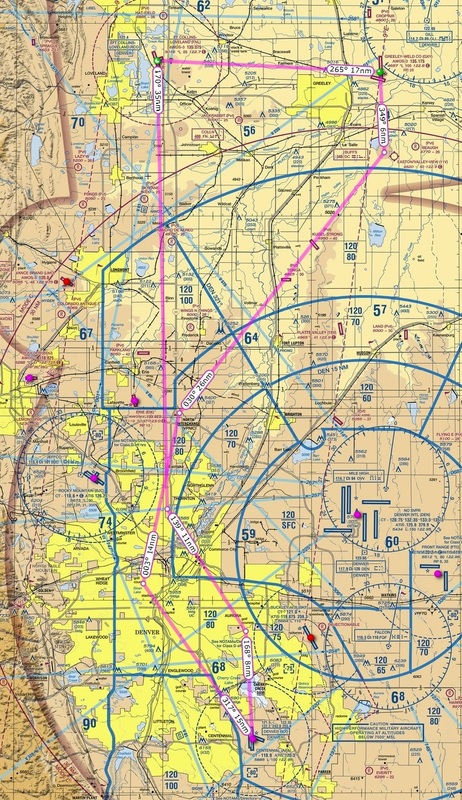 Flying in and around Denver’s Class Bravo airspace. On this flight we went to Greeley and Fort Collins for a GPS and VOR approach. The LPV went down to 200ft above ground level at the uncontrolled field. After a touch and go, I intercepted a VOR radial for the “VOR/DME-A” approach at Fort Collins. Because the runway designation was missing in the title and there was an “-A” instead, the approach couldn’t be aligned with a runway within 30 degrees and was therefore a circling approach. VOR/DME-A into Fort Collins, Colorado. While flying the approach I wondered how accurate the signal of the VOR would be. 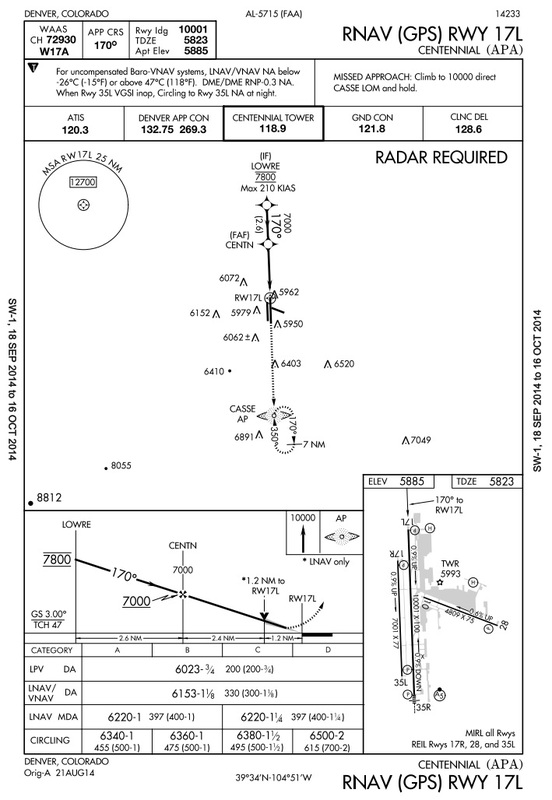 The missed approach point was at 20.9nm DME, very far away from the station at just 500 feet above ground level. 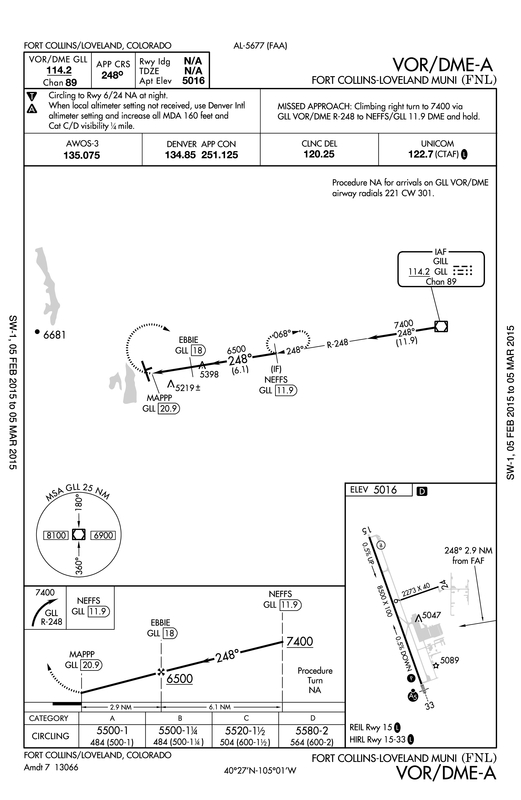 Approaching the 18 DME fix, EBBIE, the course deviation indicator suddenly went from center to far left. Something was wrong with the instrument, so I switched to NAV#2, which was working fine. At 20.9 DME I removed the foggles and looked outside. I was exactly in the right position, about where the arrow is on the airport diagram (bottom right on the chart). After overflying the runway I turned left for a circling to runway 33.
a lot of fun. If something fails, however, the workload increases tremendously. This is why any unused radio should be tuned to a station that might be of help and why a plan B must always be available. Another lesson learned was about ForeFlight. The day before the flight I downloaded an update for the app. Now the program had a bug, the screen was chaotic and I was barely able to find the pages I needed. When flying with an iPad as the primary information source it deserves its own preflight check. At least I would have had the paper charts with me. On the way back South to Centennial I had to fly partial panel until landing. Flying headings with the magnetic compass worked well and I found my way to the localizer and glideslope of the WAAS GPS runway 17L approach. Centennial Tower told me to switch to 17 right, over Arapahoe road. Again, the street was impossible to see with the foggles on. At least my instructor could look outside and we had no troubles following the roads – IFR, kind of. Next Post 45h IR – Instrument Rating, done!